Global warming? What global warming? According to the RSS satellite data, whose value for March 2014 is just in, the global warming trend in the 17 years 8 months since August 1996 is zero. The 212 months without global warming represents just over half the 423-month satellite data record, which began in January 1979. Dataset of datasets. The mean of the GISS, HadCRUt4, NCDC, RSS, and UAH monthly global mean surface or lower-troposphere temperature anomalies shows no global warming statistically distinguishable from zero over the 18 full years from March 1996 to February 2014. The 0.14 Cº trend over the 18-year period is within the ±0.15 Cº combined measurement, coverage, and bias uncertainties in the datasets. There may have been no global warming at all during the entire lifetimes of all students now in high school. Not that their teachers will have told them that. 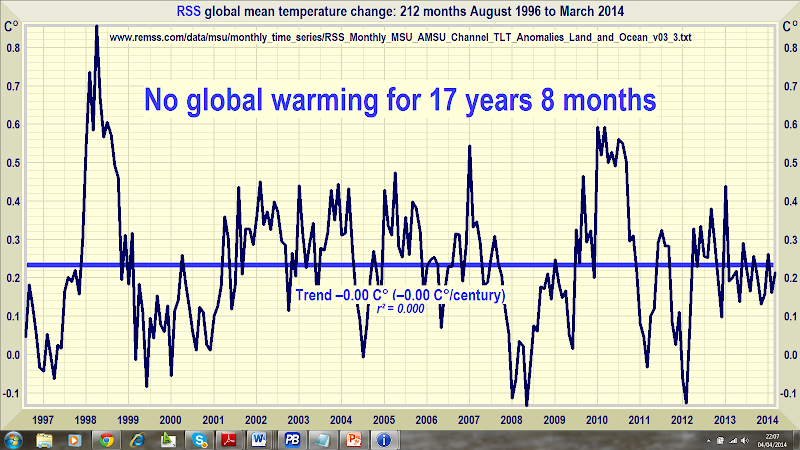 The RSS satellite dataset shows no global warming at all for 212 months from August 19996 to March 2014. That is just over half the entire 423-month satellite record. Since 1 January 2001, the dawn of the new millennium, the warming trend on the dataset of datasets is zero – 0.0 Cº per century. No warming for 13 years 2 months. RSS shows the least warming over the past 18 years; UAH, the other satellite dataset, shows the most. The difference is caused by varying adjustments to the data. Averaging the RSS and UAH data, and averaging the GISS, HadCRUT4 and NCDC data, shows a difference of only 1/30 Cº between the two trends. Our latest topical graph shows the RSS dataset for the 212 months August 1996 to March 2014 – just over half the 423-months satellite record. The graph is accurate. The data are lifted monthly straight from the websites maintained by the keepers of the datasets. A computer algorithm reads them down from the text file, takes their mean and plots them automatically using an advanced routine that automatically adjusts the aspect ratio of the data window at both axes so as to show the data at maximum scale, for clarity.